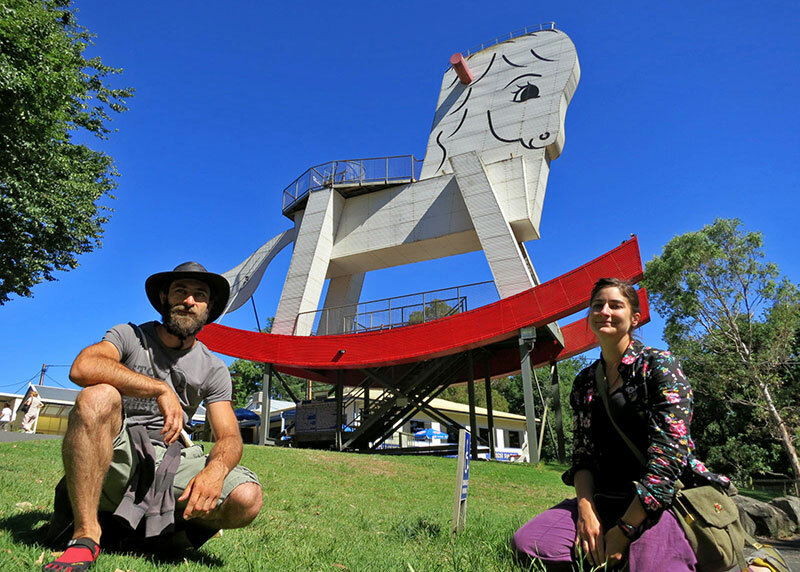 The Big Rocking Horse, the largest worldwide, is located in Adelaide Hills, Australia. Built in 1981. Call us on (08) 8389 1085. The Big Rocking Horse is a tourist attraction located in the town of Gumeracha, South Australia. Designed by David McIntosh, the structure weighs 25 tonnes and stands at over 18 metres tall, and is one of a number of Big Things in Australia designed to attract the attention of passing motorists. It is part of a larger complex that includes a wooden toy factory, wildlife park and cafe which had been owned by the Wilkinson family since the early 1970s, and while the complex was sold in 2004, and again in 2009, it continues to operate today. In 1973, after opening a wooden toy factory in Gumeracha, owner Wal Wilkinson chose to incorporate a large roadside attraction to the site in order to attract passing traffic. The first of these was a large wooden giraffe which stood at approximately five metres in height. This was subsequently replaced by a series of rocking horses: a three metre tall horse giving way to a five metre model, before the process culminated in the decision to build the Big Rocking Horse. The resulting 18.3 metre tall structure was designed by David McIntosh Taylor and it was opened in 1981 after eight months of construction and an investment of $100,000. Hallweld Engineers P/L did the fabrication. The Big Rocking Horse remained under Wilkinson family’s ownership for just over 20 years, although problems arose late in this period with an increase in insurance premiums. Although it remained structurally sound, a fall in 1999 and the change in liability insurance premiums resulted in the closure of the site to the public in 2001. Prior to this date visitors had been able to ascend to a lookout tower on the head of the structure. In September, 2003, Graeme Wilkinson placed the Toy Factory—including the Big Rocking Horse—on the market, at an asking price of approximately $900,000. It was sold in 2004 to Anthony Miller, who had emigrated from South Africa in 1999. Under Miller the structure was restored and reopened to the public, with visitor access to the viewing platforms available from April, 2004. Changes made by Miller, including the reopening of the Big Rocking Horse and the removal of entrance fees to the associated wildlife park, saw an overall increase in visitor numbers to the complex from 65,000 in 2003 to 200,000 in 2006. In June 2009 the business was purchased by Frans and Lyn Gous, another family of business migrants from South Africa, and continues to go from strength to strength. In 2013 the Rocking Horse was closed for a period of about 3 months while extensive work was undertaken to bring it up to modern safety standards. Grad Zivkovic from Automotive Safety Engineering did all the engineering design required at no charge, and Rob Fleming did the steel construction. The Big Rocking Horse is recorded in the Guinness Book of Records! The Big Rocking Horse is 18.3 metres in height and 17 metres in length. Made of steel, the structure weighs 25 tonnes, and it is set in 80 tonnes of concrete to prevent rocking. The steel frame was fabricated by Hallweld Engineering in Adelaide and transported by road to the site, after which the steel cladding was attached. Stairs incorporated inside the rocking horse lead to three viewing platforms: one at the head, one on the saddle, and a third on the “rocker bows” near the base of the structure. The Big Rocking Horse is part of a larger complex incorporating the Toy Factory, a cafe and a wildlife park. The factory sells a large range of wooden toys and souvenirs, while the wildlife park (which covers approximately seven acres), features a number of native and introduced species, including emus, wallabies and kangaroos. The cafe can seat up to 65 people, and serves a range of well-priced breakfast and lunch alternatives.